Everybody is keen to know time taken for double the investment. We want to double our investment in short span of time. For getting money double in 5 years, required CAGR( Coumpund annual growth rate) is 15%. However, there is no guaranteed-return product that offers such a high rate of return and the only possible way to achieve this is by taking risk. But there will be no guarantee that the objective will be achieved, which means the capital may get doubled or be more in five years or may even get halved or be less or may remain stagnant. As very few people want to see their capital erode due to fluctuations in the markets, let us discuss how much time the amount invested in fixed-return instruments would take to get doubled. The investments in Post Office time deposits are considered better due to the sovereign guarantee and higher rates. The interest rate on Post Office also varies from tenure to tenure and the highest rate for normal citizens is 7.8 per cent for 5-year time deposit. 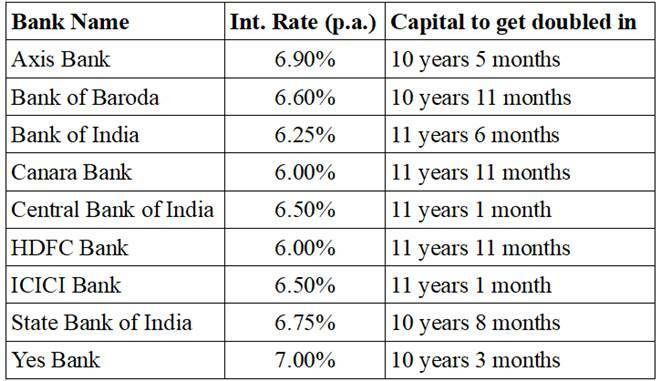 At 7.8 per cent your capital will get doubled in 9 years 3 months.